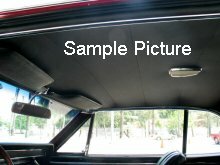 Stock Interiors is proud to offer the highest quality	Headliner Replacement kits available. Our Headliner Kits are made to look and fit just like your original headliner. Our manufacturer has been making headliners since 1949 and the patterns were created when the cars were first introduced. So you can be sure that your headliner will always fit and look just like new! Please provide the body style number from your car. You can find the body style number on the ID plate of your car. If you are unable to find the ID Plate please type the body style (i.e. SS Fastback, Custom Coupe). This will help us to verify that you have	ordered the correct part. Note: You will need to use the hardware from your original headliner.